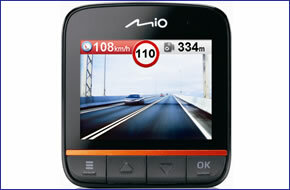 Mio MiVue 388 Digital Video Recorder (DVR) features a 2.4-inch screen to display the units 120 degree view of the road ahead. The 388 is the top-of-the-range model in the Mio MiVue drive recorder range and records in full 1080p High Definition (HD). Inbuilt into the MiVue 388 is an impressive 5.0 megapixel digital camera along with a rechargeable battery. Additional features include: HD output, 3 axis G-sensor, parking mode, advanced optics, GPS tracking and free lifetime speed camera alerts. Making the MiVue 388 the perfect eyewitness for anything that may happen on the road ahead and recording all the evidence. Mio MiVue 388 has been discontinued. Mio MiVue 388 in-car digital video recorder captures video (both visual and audio) from a drivers perspective of the road ahead. This video can then be used as evidence of events along your journey such as incidents for insurance purposes. The MiVue 388 records in full 1080p High Definition (HD) and unlike other DVR systems which require a TV or PC for video playback, with the MiVue 388 you can watch it back on the device itself as it has a 2.4-inch screen. The video is continuously recorded to an 8GB micro SD card that is included with the device when purchased from ActiveGPS. The Mio MiVue features a 5.0 megapixel camera which includes a high-quality camera lens providing great pictures day or night. The camera shoots in a wide angle of 120 degrees so this means it has a wide viewable/recordable area so the maximum amount of information is recorded. There are speed camera alerts FREE for the lifetime of the MiVue 388. These speed camera alerts are provided by RoadPilot. The screen displays your current speed, the speed limit and the distance to each camera. The camera lens is designed to work well in both daylight and at night time using its low-light sensitivity lens. This makes this MiVue a very versatile device ideal for use in all road and weather conditions. There is an integrated GPS receiver and you can track your routes on Google Maps. Using the MiVue software manager enables you to track your vehicle. It also allows you to share your videos on YouTube and Facebook. In addition you can analyse a 3 axis g-shock sensor to see where impacts to your vehicle come from. The Mio MiVue's Parking mode sets the system up to detect motion in front of the camera and record all activities whilst your car is parked. The MiVue's battery is 470mAH and it includes a rotating mount making mounting the device very simple and effective. Do you have a question about the MiVue 388 that's not been answered on this webpage? Please see our Dash Cam FAQ's for questions from other people. If the answer to your question isn't featured, use the online form to ask us for the answer. Alternatively please telephone 01733 777623 Monday to Friday (9:30am-5:00pm) to speak to one of our sales team.